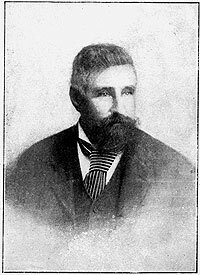 Henry Leonard Reynard (HLR) was born in Yorkshire, England in 1845, the fourth of six children: his father came from an old landed family. Henry was educated at a boarding school in the suburbs of London. His father owned race-horses, and young Henry subsequently spent a lot of time with them — caring for them, riding them and racing them: it was a love that would last throughout his life. At age 21, seeking new horizons, he left for Argentina, where he acquired a share of an English-owned estancia in Santa Fe province. At the suggestion of one of the partners, HLR made a visit to Punta Arenas (Chile) in 1874. He was favourably impressed by the economic possibilities of the Magallanes region of Patagonia, and decided to relocate there definitively. At that time, the expatriate community in Magallanes was very small. HLR entered into partnership with James Henderson Dunsmure, the local British vice-consul, operating a sawmill and hotel. After Dunsmure's death in a sailing accident, HLR became vice-consul, a position he held for many years. HLR was one of the first in Patagonia to foray into the sheep-raising business — previously, animals had been imported from the Falkland Islands, but only for human consumption. In 1877 he started a small ranching operation on Isla Isabel (Elizabeth Island), located on the Magellan Strait. Its success led to full-scale ranching of sheep, cattle and horses at Estancia Oazy Harbour. At this period, land was held on long lease from the Chilean government. In 1880, HLR married Marie Domange, a young French widow, whose husband François Roig had been drowned along with Dunsmure. Marie inherited her former husband's business, initially looking after it, and later working with Henry to run the Estancia. When he came of age, her first son, Frank Roig, became her business partner. Four of Marie and Henry's children survived to adulthood. Thanks to HLR's early pioneering work, numerous new entrants into the sheep industry obtained their first animals from his flocks. He comes across as an amiable figure, willing to help others and consequently well liked. The success of the ranching industry led the Chilean government to sell the region's lands by auction in 1903. HLR was outbid, losing Oazy Harbour; he was obliged to move his operations to Argentina. Some time earlier he had purchased Estancia Cañadón de las Vacas, in Santa Cruz province; this was to become the family's new home. Across the years, the family maintained ties with England, educating the children there and purchasing a home. With advancing age, Marie and Henry spent more time in his native Yorkshire, dying there in 1910 and 1919 respectively. Their two daughters, with their husbands, continued the family business in Santa Cruz, which is held by their descendants to this day. After Henry's death in 1919, his children found that the autobiography he had begun in 1911 was incomplete. The main body of the text described his early years spent in England, but, even so, many of the anecdotes concerned other people, rather than himself. There was some sketchy material about his first years in Northern Argentina; but about Patagonia — the scene of his main accomplishments — nothing. To fill this void, they then set about contacting family, business associates and old friends, asking them to share their memories of HLR. The most prolific of these contributions came from William Greenwood, one of the earliest English settlers in Magallanes: his material is an important addition to the early history of the region. Further interesting material came from Carlos Webster; in his case, information concerning horse-racing in the Rosario district (Santa Fe) during the 1870's. The collected materials were typed — 178 double-spaced pages — and appear to have been circulated within the family for comment. We have no information about why the work was not published at that time. [However, the "manuscript" must have been accesible, because the Chilean author Claudio Chamorro used some of its data for his 1936 book "Bajo el Cielo Austral".] In 1982 there was a renewed interest in publication, and efforts were made to improve the appeal of the subject to the general public, but this initiative did not bear fruit. Currently, the bound typescript is carefully stored in the family home. In 2013, thanks to HLR's great-grandson Robert Lemaire, we had the opportunity to examine the original book, making a photographic copy for further study. In our judgement, beyond the biographic dimension, there is much of interest to historians: first-hand accounts of the city of Buenos Aires, life in the pampa, details of stock-raising, incidents from "early times in Patagonia" and so forth. With Robert's consent, we undertook to transcribe the complete text. This is now uploaded to our web-site, where it will remain available to all who wish to study it (or simply to enjoy it). The book comprises three sections (summaries of their contents appear below). The web layout closely follow the original material's page-content and numbering. Occasional, minor corrections have been made to spelling and punctuation. Editorial notes are shown [thus]. Note: For rapid reference, see this short biographical summary of the Reynard—Domange family. Advice to the reader: The trustworthiness of specific data presented in the text depends on the time elapsed since the events described, as well as on the informant's memory. Therefore, please be cautious when reading memories recalled in later life, which should be validated against other sources, such as diaries or official papers.